Sunny War has had one heck of a year, and she capped it off with a late-November performance at the Kennedy Center For The Performing Arts in Washington, DC. According to the Kennedy Center’s site, War is “a master of fingerstyle guitar with a superb clawhammer technique.” She’s also a tremendously gifted songwriter with a powerful voice. See her entire performance at the Kennedy Center right here. 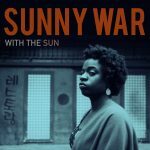 Sunny War’s With The Sun LP continues to find airplay on new stations around North America. Get her spinning now if she’s not already in your rotation.